The Boulder Public Library offers free access to tons of books for adults and kids alike. If you use a reader, this is a great resource! We try to buy used books, but now that at least 3 people in our family have eReaders that is tougher. We can’t go to the Bookworm or the Boulder Bookstore. We cannot borrow from friends. Instead we felt like we were stuck buying the books for ourselves and our kids through Amazon. I started looking for more options and I found that the Boulder, Lafayette & Louisville Public Libraries offer access to a lot of great books for our readers online. Score! That will send you to the Front Range Downloadable site. Click on the “Children’s Titles” section. 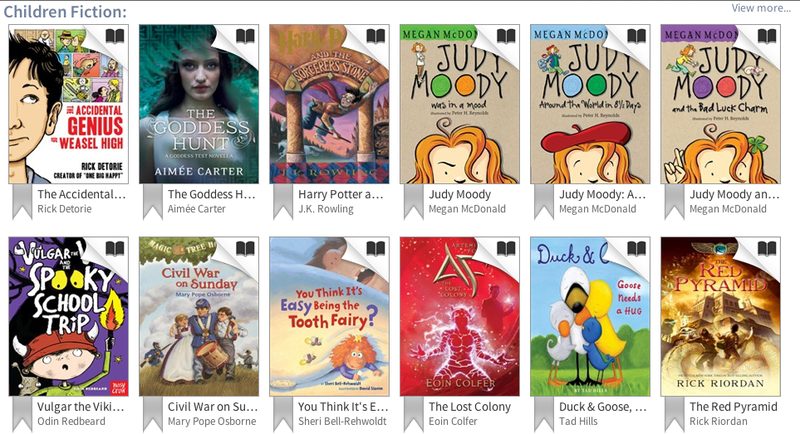 You can choose between Children’s Fiction or Nonfiction & Teen Fiction or Nonfiction. There are simply tons of great titles that you can “borrow” for a week. This is a screen shot from the site. I poked around a bit and found that most of the titles were available. If you or your kids are reading on an eReader this is a great cost saving resource for your whole family! Thanks, Boulder Public Library!!!! This entry was posted in Uncategorized and tagged Adults, Amazon, Books, bookworm, Boulder Bookstore, Boulder Public Library, children, eBooks, ereader, eReaders, family thanks, Free, great books, Kids, Kindle, Literature, teen fiction by Boulder Families. Bookmark the permalink.